Class “C” All-State Football -1976. All-League Track – 1975, 1976. All-Big Ten – 1978, 1979. 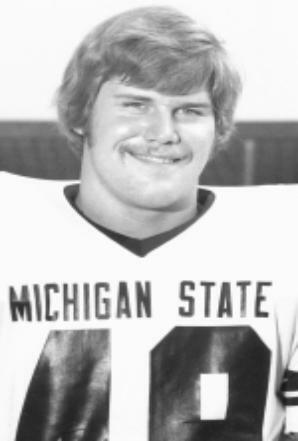 MSU Most Valuable Player Award – 1979. Held MSU record for Most Career Tackles – 541. Calgary Stampeders – 1981 thru 1983. Edmonton Eskimos – 1984 thru 1991. Grey Cup Champion – 1987. CFL All-Star – 1982, 83, 86, 88, 89, 1990. Dr. Beattie Martin Trophy – 1988, 1989. CFL Most Outstanding Defensive Player – 1989. Edmonton Eskimos Wall of Honour – 1992. Inducted into the Canadian Football Hall of Fame – 2000.